Give your sound the human touch with the super-expressive Akai ESI4000S wind controller. It includes a MIDI output and a built-in analog modeling synth. The Akai Professional EWI4000S electronic wind controller incorporates several improvements in the development of MIDI/Synth instrument capabilities. With the sound module and the instrument all in one product, players no longer need to be tethered to a module. By using MIDI and audio wireless transceivers, EWI4000S players can move freely on the stage as they are playing. The user can easily switch between programs on the EWI4000S directly with a dedicated Program selection button, or use the note keys to select stored patches. 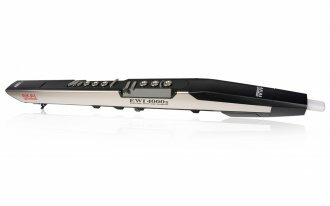 The EWI4000S offers performance control features as well, such as the Octave Key. When you activate the Octave mode, you will get an automatic doubling of notes at one octave below the note you are playing. There is also a Hold Mode, which holds a note that you select enabling you to solo around that note. This is the first EWI with a sostenuto capability! Besides being a great wind controller, you also get a first rate synthesizer. The EWI4000S' synthesis features were not available on previous EWIs. The internal analog modeling synth has two voltage controlled oscillators (sawtooth, triangle, square with pulse width waveforms) with individual volume control. The voltage controlled filter has a feature which allows you to change from 2 to 4 pole filters. The EWI4000S's noise generator and dedicated VCF add more realism to your playing, emulating breath noise. The EWI4000S' sweep function works more effectively than a typical envelope generator. As you change the force of your playing the sweep parameter will alter the shape of the sound. The synth contained inside has a LFO (low frequency oscillator) specifically for the voltage controller filter modulation. This LFO affects vibrato as you use the bite sensor. The EWI4000 also has built-in effects, a first for Akai EWI products, such as Reverb, Chorus and Delay to thicken or double-up your solos. Since it would difficult to put all the knobs and buttons on the EWI-4000 that are needed to adjust the various parameters, the EWI4000S will come with a computer editor program to allow users to customize all their sounds ahead of time for live performance. This editor will come standard for Windows and Mac computers. All of your edited Programs can be stored inside the EWI4000S so you can recall your settings instantly during your performance. The EWI4000S is Akai's state-of-the-art Electronic Wind Controller. This one-of-a-kind instrument contains an industry-first internal sound source. With multiple functions the EWI4000S pushes the envelope of MIDI/Synth capabilities and is available at an affordable price. Available until 11 PM (EST) today. Mention special code 200-5Q7J when you call.